Welcome to our Introduction to Coconut Water! So you’ve heard about coconut water, the latest craze in natural energy drinks, and ended up here to find out more. Well, you’re in good hands, because this site has basically everything you need to know about coconut water – its benefits, nutritional data, the best coconut water brands, and where to buy them cheapest. But before I begin, I have to tell you that I am not affiliated with any coconut water companies. I do not produce coconut water, and I wasn’t paid to create this website. I am simply a web designer on a little mission. I made this site because there is no one-stop source of information to find everything you need to know about coconut water. After it nearly saved my life after I had a critical dehydration and low blood sugar situation, I decided it was time to learn more about coconut water and show the world my findings. This site is the end result – and each of the pages linked from this intro to coconut water will give you more details. 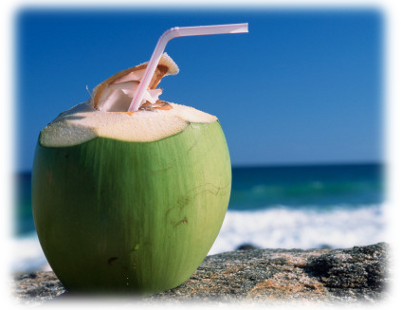 Coconut water is the fresh, clear fluid inside of a young coconut, the fruit of the famous coconut palm tree. Coconut water has long been a prevalent drink in the tropical countries, Latin America, and Southeast Asia, where it is widely available as a fresh fruit, or in can or bottle. It is fat-free, cholesterol-free, and low in calories – but high in nutrients and electrolytes. In Central America, coconut water is available at highway stops or on the beaches; there, the coconut water is called “agua de pipa”, and the coconut is cut in front of the buyer to guarantee its freshness. In Brazil, they call it “água de coco”. But that doesn’t do us Americans or Europeans much good! So with new advances in technologies, coconut water is now available in tetra packs, which use extremely sterile, long-lasting asceptic packaging. And companies like Vita Coco, O.N.E., Harvest Bay, and Zico have found a way to bring them right to your door, thanks to Amazon. You should drink coconut water because it tastes great, quenches thirst, and is far healthier than drinking soda or other sports drinks! Not everyone loves the taste, but I do, and I think you will too. If you don’t, then you can try some of the flavored versions, such as Vita Coco’s Pineapple flavor. Amazing stuff! Is great for healthy skin – It helps hydrate your skin but can also be used topically to cure acne scars and other types of blemishes. This list only scratches the surface of the great things coconut water can do, and why, so if you’d like more information, see our detailed Coconut Water Benefits page. Coconut Water is extremely safe! First off, the coconut water itself is extremely sterile, as it’s been trapped in one of Mother Nature’s cocoons, the coconut itself! Coconut water has anti-bacterial, anti-fungal properties, which are also mentioned on the Coconut Water Benefits page linked above too. Since coconut water is so sterile, and has the same five electrolytes in our human blood, it has been successfully used as an intravenous fluid in dire emergencies when there are no other IV fluids around! Second, the coconut water products that can be purchased here are pasteurized and then placed into the asceptic packaging tetra packs, which keep foreign light and bacteria out until you open it. It’s worth mentioning that once you do open your coconut water, you should refrigerate any unused liquid and finish it within 24 hours. As to whether there are any side effects to drinking coconut water – no, there are not. Coconut Water has a pH level extremely close to our blood, and there are nearly never any adverse reactions with properly packaged and pasteurized coconut water. It is important to note that coconut water does contain natural sugars, so if you drink too much of the stuff all day long, especially just before bed, you can gain bodyfat and get cavities in your teeth. That said, it has far less sugar than soda, fruit juices, and sports drinks, allowing you to drink a lot more without those nasty effects ever occurring. It truly is a great alternative. We discuss this in the Coconut Water Diet page. The benefits of drinking coconut water come from its nutritional contents. Most importantly, coconut water is jam-packed with electrolytes that are needed to maintain functions in our body. Electrolytes are basically small, electrically-charged “ions” in your bloodstream that cause chemical reactions to occur – chemical reactions that your skin and muscles need to stay healthy and hydrated. Whereas the most popular sports drinks only have two electrolytes, coconut water has all five electrolytes that are already in our bodies – and in much higher doses. This includes potassium, magnesium, phosphorous, sodium and calcium, and makes it a much better thirst quencher and blood regulator as well. Up above, you’ll see an image of Vita Coco’s nutritional ingredients. This is typical of all natural coconut water products. As you can see, an 11oz container of coconut water is fat-free and cholesterol-free, but there are 15g of carbs that come in the form of natural sugars. The high electrolyte content is also displayed. These numbers are the perfect amounts to get your day kickstarted. You’ll note that sports drinks manufacturers don’t put the amount of electrolytes on their labels. This is for a reason — their nutritional content is embarrassing compared to coconut water. It is the triple-whammy of a perfectly safe amount of sugar, high electrolyte content, and water inside of coconut water that saved me from a horrible situation of dehydration and low blood sugar. I returned from a gut-wrenching race where I didn’t take care of myself afterwards because I was feeling so good. After a bit of celebration, I began to crash. Within no time, I was extremely dizzy and faint – hardly able to hold myself up. I tried drinking water, but it didn’t help – and then I sadly threw it back up. Thankfully, I had been given some coconut water after the race, and decided to give it a shot before asking a friend to take me to the hospital. I drank the coconut water, and was able to keep it down – my body was rejecting water with no electrolytes, but it was fine with the pH of the coconut water. Before I even finished the 17oz container, I felt like a million dollars – my blood sugar immediately kicked back up, and I was alert and focused again. It was amazing to feel. I knew it wouldn’t last forever, so at this point, I drank a lot of water that I finally kept down, and ate a lot of food. And because of that awful situation, you have this site. You can read more on our Coconut Water Nutrition page. There are several popular coconut water brands. Among our favorites are Vita Coco Coconut Water, O.N.E. Coconut Water, Harvest Bay Coconut Water, and coming soon, Naked Coconut Water. 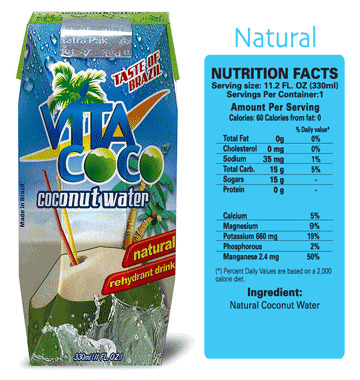 Vita Coco is our featured brand here – great deals and the best, natural taste. In addition to those, Grace Coconut Water is a bit different since it comes in a can and has extra sugar added. Finally, there is ico Coconut Water, but with that one, we warn you to only go with the 11oz containers, since the 14oz bottles are not natural (they’re from concentrate and have additional flavoring and they don’t review well). We wholeheartedly believe that the best place to buy coconut water is online. The prices are by far much better than in your local specialty stores, and coconut water still hasn’t made its way to all parts of North America. You can get free shipping, and the ever-sterile coconut water in the asceptic packaging will keep it completely fresh. We also have the price comparison widget below, and will help you find the best deals on coconut water. I hope you’ve learned a bit about coconut water and my experience with it. You can Contact Me with any questions, or check out all of the links on this page. way to make a coconut custard pie. I was told to stay away from soy products because soy produces estrogen. Will the custard pie or coconut custard pie produce estrogen? If yes will it every be considered too much estrogen for good health? THe coconut custard pie calls for 1-1/3 cup of coconut fruit and 4 eggs. too risky to include a coconut custard pie in my diet made with Nutra Sweet weekly? Or could I have the coconut custard pie at least once a month? Coconuts don’t have NEARLY the amount of phytoestrogens that any soy-based product has. However, there are some in there, but nothing nearly as dangerous as those unnatural legumes. Keep away from soy, soybeans, tofu, or soybean oil in any capacity and consider a diet that is mostly organic and uses grass-fed or pastured, free-range meats and eggs. The paleo diet is worth looking into. You may want to concern yourself with the nutra sweet though. Obviously we’re not doctors so ask them if artificial sweetener should be avoided. Perhaps you can make use of a stevia-based sweetener instead, which is more natural. / I’m glad you don’t mix any water to your coconut milk. Adding water, weehhtr hot or cold, will only dilute the coconut milk which most recipes do no require. better to extract it by itself. I’t’s quite easy. How does coconut water process? thank you!